Visit these historic places. 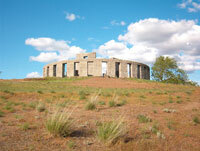 landmarks, and museums located in Wasco County and the Mid-Columbia River Gorge area. Living history museum located in historic log cabin on Main Street in the Wasco County community of Dufur. Located in the historic Schreiber Log Cabin on Main Street, featuring pioneer living history exhibits, weaving, old photos, farm implements and more. Museum opens late May and operates noon to 4 p.m., Thursdays through Mondays. Information: (541) 467-2349. This is the official, regional interpretive center for the Columbia River Gorge National Scenic Area. The Columbia Gorge Discovery Center & Museum focuses on natural history and human cultures of the scenic area. The museum traces the history of Wasco County, including both Native American history and pioneer development. Displays on the Ice Age Lake Missoula Floods, early explorers Lewis & Clark, and early pioneers on the Oregon Trail. The museum is open daily except Thanksgiving, Christmas and New Year’s, 9 a.m. to 5 p.m. (541) 296-8600 ext. 201. Directions: Interstate 84 to The Dalles, take exit 82, then west on West Sixth Street (Highway 30) and follow the signs to Discovery Drive. www.gorgediscovery.org. One of the oldest historical museums in Oregon, (established as a museum in 1905), the Fort Dalles Surgeon’s Quarters was one of several buildings constructed on the Fort Dalles Military Reservation. The Surgeon’s Quarters was built in 1856, and this gothic revival structure is the fort’s last surviving officer’s quarters building. The building is still located at the original site, and this historic museum houses a variety of pioneer and military displays from the U.S. Army based at this location in The Dalles in the 1850’s-1860s, during the time of the Cayuse, Yakama, and Modoc Indian Wars. Visitors are also able to tour the Anderson House, a homestead built of hand-hewn logs crafted by Swedish immigrants. The Anderson Farmhouse is registered as a National Landmark. There’s a large collection of antique vehicles and horse-drawn wagons, including the restored Umatilla House wagon. Directions: Follow signs from The Dalles Post Office on West Second Street, or take Union Street to 14th, right to Garrison, left to 15th. Or try Trevitt Street to 15th, left 1 block. Hours: Open every day 10 am – 5 pm Memorial Day through Labor Day. Call for off-season schedule. Please call in advance to schedule group tours. (541) 296-4547. The oldest home in The Dalles was built sometime after 1850 by a non-commissioned officer stationed at Fort Dalles, and operates today as historical museum. The house was once owned by Oregon State Congressman Malcolm Moody, and later purchased by Eck and Mae Rorick. The Moody/Rorick House is operated by Wasco County Historical Society and is on the National Register of Historic Places. Beginning Memorial Day through Labor Day, the Rorick House will welcome guests Fridays through Sundays, 10 a.m. to 4 p.m. Location: 300 West 13th St., The Dalles. Public tours. Granada Theatre – When it opened in 1929, the Granada Theatre in downtown The Dalles was the first “talkie” west of the Mississippi River. The building has been recently purchased, and is not yet open to the public. Visitors are welcome to view the exterior of this unique building on Second St. It is a historic landmark in the Moorish architectural style. 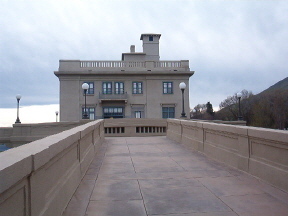 The Dalles Lock & Dam Visitor Center at Seufert Park is surely worth a visit. In 1957, the completion of the dam at The Dalles inundated Celilo Falls and Lake Celilo formed behind it. The unique design in the form of a backward L takes advantage of a natural rock formation in the river to connect separate spillway and powerhouse sections. The generating capacity is 1.8 million kilowatts and can light up two cities the size of Portland, OR. The pool behind the dam is called Lake Celilo and it stretches 24 miles upstream to the John Day Dam. Directions: At the junction of Hwy 197 and I-84, take the exit to Bret Clodfelter Way, follow to the end of the road. The Dalles Fire Dept. Museum – The first fire department in The Dalles began in 1859. The Dalles Fire Dept. Museum showcases two antique fire engines, photos, and antique fire-fighting gear. The museum is open from 8 a.m. to 5 p.m., Mon-Fri. Free Admission. Located in City Hall, 313 Court Street. 541-296-5481 x 1119. Corner of 3rd & Court Streets in downtown The Dalles. The museum is scheduled to open in the spring of 2017. Located in the renovated Historic Elks Temple, the museum will be dedicated to the history of neon signs, and will take you back as far as the 1600s. 3601 W. 10 th St., Former Wahtonka HS building. East Entrance facing track & athletic fields. History and memorabilia from The Dalles District 9 and District 12 schools over the past 100+ years. If you are planning a class reunion or just have a hankering to wall the halls of your memories, give Rymmel a call to schedule visiting hours. 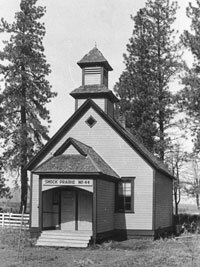 One-room schoolhouse and museum located in Wamic, on the old Barlow Trail. From The Dalles, drive south to Tygh Valley on Highway 197,then west to Wamic. Located in west-central Wasco County. Open summers only. Exhibits of the western Columbia Gorge with special focus on historic paddleboats, railroads, and steamboats in the Gorge. Exhibits feature history of the Bridge of the Gods, early river navigation, and development of the portage and locks around the Cascades rapids. (The rapids were subsequently inundated by construction of Bonneville Dam in 1938). Weekends only, noon to 5 p.m. through May; open daily June through October, 11 a.m. to 6 p.m. Closes November through April. 1 NW Portage Road near Port Marina Park in Cascade Locks. (541) 374-8535. Adjoins the Mt. Hood Railroad stop in Parkdale, Hood River County. Eclectic collection featuring Native American dolls, taxidermy and other displays. Hours vary by season. For details, call (541) 352-6808. Farm machinery, tools, household items, memorabilia from Sherman County’s early settlers. The museum also presents its popular Oregon Trail exhibit, providing an extensive study of the individuals who settled this wide-open plateau country between the Deschutes and John Day rivers. The museum comprises 14,280 square feet and more than 15,000 artifacts used by Native American families, Oregon Trail pioneers, rural households and other historic activities. Hands-on activities include wheat farming, rural living, patriotism, toys, period rooms, Native Americans. From Interstate 84, take Highway 97 south from Biggs Junction to Moro. Watch for directional signs from Highway 97. Hours: 10 a.m. to 5 p.m. daily, May through October. The Museum Complex is comprised of several historic buildings including a settler’s cabin, one-room schoolhouse, train caboose, barbershop, and the 1905 Union Pacific Railroad Depot. Inside the depot are displays of an early farm kitchen, dining room, parlor and bedroom and collections ranging from historical photos, antique hand tools, dental equipment, rocks and minerals, old bottles, the 1938 movie projector from the Liberty Playhouse, Condon High School trophies and yearbooks, postal boxes from discontinued post offices around the county, and more. The Machinery Display Building, completed in 1998, houses an extensive farm equipment collection. Native American displays, songs, and culture of the Confederated Tribes of Warm Springs are highlighted in this colorful facility near Kah-Nee-Tah resort. From The Dalles, follow Hwy. 197 south to Hwy. 97, continue south to Madras and northwest along Hwy. 26 to Warm Springs. From Hood River, follow Highway 35 south to the Highway 26 junction, then head southeast on Highway 26 to Warm Springs. Information: (541) 553-3331.10 a.m. to 5 p.m. daily except Christmas, Thanksgiving & New Year’s Day. 2189 Hwy 26, Warm Springs 97761, telephone (541) 553-3331. Columbia Gorge Interpretive Center – Located west of Stevenson, near Skamania Lodge off Washington Highway 14. The interpretive center features a Creation Theatre, 37-foot replica of a 19th Century fishwheel, restored Corliss steam engine, exhibit on Native American dip-netting, Columbia River navigation exhibit. From Interstate 84, take the bridge at Cascade Locks over the Columbia River to Washington Highway 14, then east. Open daily, 10 a.m. to 5 p.m. except for New Year’s Day, Thanksgiving and Christmas. (800) 991-2338. Located between Hwy. 12 and SR 14.From Interstate 84: Biggs Junction exit, then north on Hwy. 97 to Washington Hwy. 14, and west three miles. Maryhill is located 100 miles east of Vancouver, Wash. on Washington SR 14. Ongoing exhibits include American Indian basketry, sculpture by Auguste Rodin include models of The Thinker, chess set collection, Russian icon collection, Romanian royal family heirlooms including the throne, and coronation gown of Queen Marie, and artifacts from the Lewis & Clark expedition, including two of President Jefferson’s peace medals (only 5 of 56 originals exist) the explorers carried with them, and maps and journals. The Lewis & Clark Expedition once camped on the grounds of what is now Maryhill Museum. In 1907 Samuel Hill (1857–1931), a wealthy entrepreneur bought 6,000 acres of land overlooking the Columbia River as the site for his own home. It was engineered to last 1000 years. In 1914 construction began of his poured concrete castle-like chateau overlooking the Columbia River. Among Hill’s many personal friends: dancer Loie Fuller, Alma Spreckels, Auguste Rodin, and Queen Marie of Romania. The museum opened to the public in 1940 on Sam Hill’s birthdate, May 13. Sam Hill was one of the primary proponents of the Historic Columbia Gorge Highway 30. Built by Sam Hill as a tribute to the soldiers of Klickitat County who lost their lives, Maryhill’s Stonehenge is the first monument in our nation to honor the dead of World War I. The structure is a full-scale replica of England’s famous neolithic Stonehenge. The monument lies at the original Maryhill townsite, four miles east of the museum, just off Washington Scenic Route 14. Hill’s own crypt is a short walk southwest of Stonehenge on a bluff overlooking the Columbia River. Klickitat County Museum – Presby Mansion in Goldendale features farm equipment, pioneer furnishings, tools and artifacts, in a classic Victorian home. 127 W. Broadway. Hours: 9 a.m. to 5 p.m. daily, April 1 through Nov. 1. Off-season by appointment. (509) 773-4303. Gorge Heritage Museum – Pioneer history and Native American pre-history of the western Columbia Gorge. Photo displays, post office display, military items. 202 East Humboldt, Bingen. Hours: Thursdays through Saturdays, 11 a.m. to 4:30 p.m. (509) 493-3228.